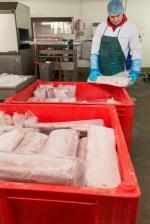 Red Dolavs being loaded with flaked ice ready to deliver as soon as fleet arrives. Safely stack 9 high - no need for racking. 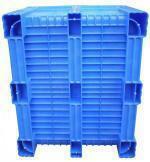 Plastic pays for plastic box pallets. 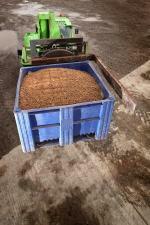 Dolavs being crushed on the largest compression test machine available in Europe. Dolav has developed its Ace box to be winchable. Dolav ACE being emptied on fork lift. Hand picked grapes carefully emptied into Dolavs read for roadside collection. Waste ice being collected in green Dolavs. 30 years old and still going strong! Euro size Dolav available in a range of colours. Standard 1200 x 1000 x 740mm Dolav footprint. Available in either fully solid or perforated versions and a range of colours. 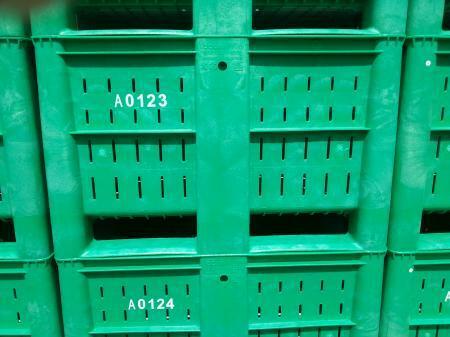 Standard 2 runner perforated Dolav box pallet. Available in a range of colours. 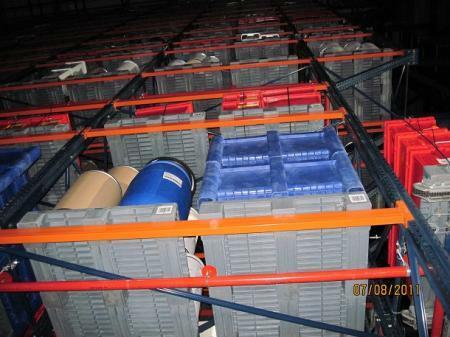 1200 x 1000 footprint heavy duty racking pallet. "No need for insulated boxes in our high speed unbroken cool chain," says Michael Lodahl at Danske Fiskeauktioner (DFA) in Jutland, Denmark. The Dolav box lasts us as long as the old insulated boxes and have the advantage that we do not get contamination into the insulation material in the middle of the insulated box wall. If we do have a broken Dolav box it is very easy to repair before it goes back into production." 30 year old Dolav still in use. 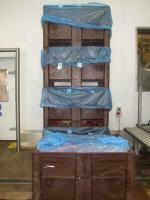 Even after 25 years service, meets all current and anticipated food and juice fruit handling standards. 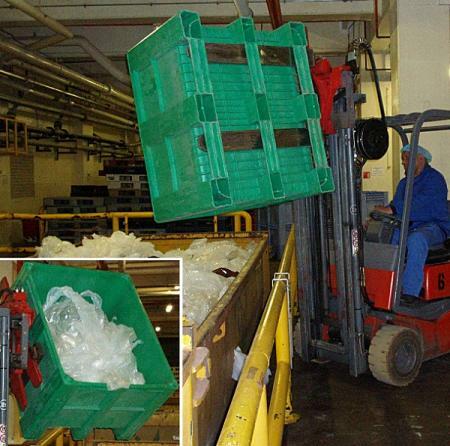 Grower member, Boxford (Suffolk) Farms has been using the same perforated Dolav plastic pallet boxes for 30 years for handling apples from tree to store and for longterm storage. They have lasted so well that Plantsman PO is adding to its existing Dolav box stock by about 1000 each year. 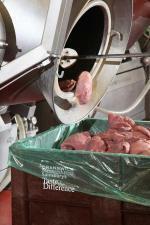 How Dolavs are working within food processing. 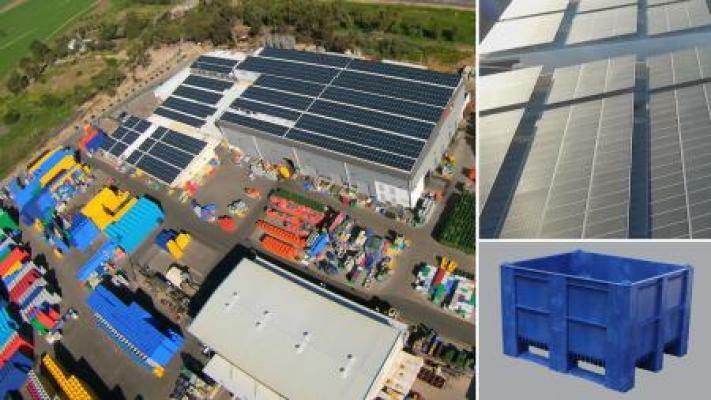 "For broccoli and melons the Dolav Kitbin is a saviour for us" says Trevor Shulton, managing director at Gravenend-based Rodanto. 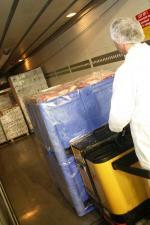 "We have seen every possible type of pallet box in the last30 years," said Keith Rataj at high-tech bacon processors, Quality Foods of Aberdeen. "They range from the good to the most ridiculous. Sometimes things are just good the way they are and they do not really need improving. 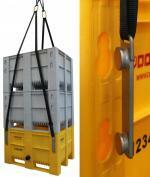 However, the Dolav Ace box, with strength in the legs and the corners, is a great step forward. Dolav has kept the design concept the same and basically improved what was already a very good pallet box," he said. 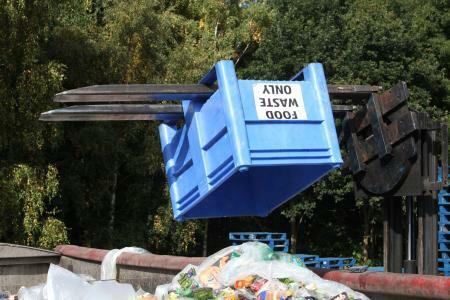 Aldi handling food waste in Dolavs. 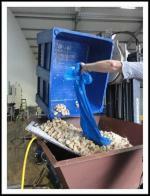 Stafford Bye Products keeping it "Cat 3 Clean" and profitable with the Dolav Ace. Drop, crush, spike and rotating tests on Dolav ACE. 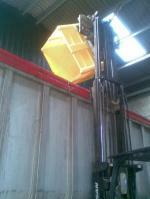 Fork lift Abuse on a Dolav Lid. Dolavs in use at Cranswick. We sell capital equipment that lasts for years. Owners like to be able to recognise their boxes from a distance. 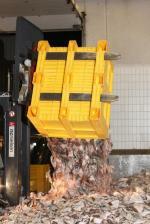 Nesting Dolavs to reduce transport costs.